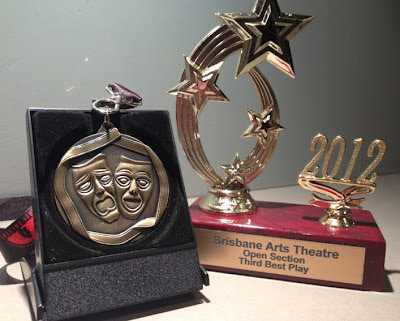 For years, I've been meaning to write a one-act play and enter the Brisbane Arts Theatre Drama Festival. Every July it comes around, and every July it passes me by. Lack of time, lack of ideas, lack of any real knowledge about how South-East Queensland's festival circuit works. The deadline for entries was June 30. That day, I dropped in my entry form and $35 entry fee. 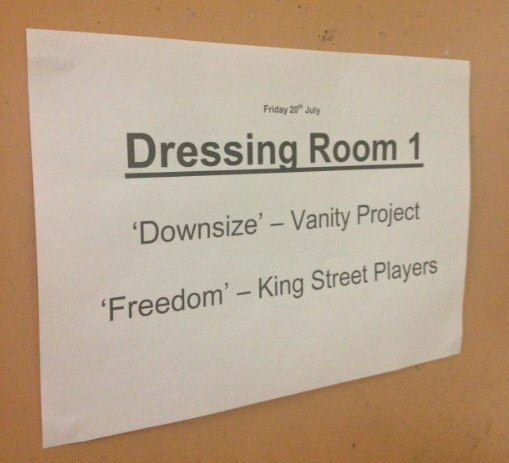 I even wrote down the name of my play: Downsize. What I did NOT include was the script. Because I didn't have one. Luckily for me, I know peeps up at the BAT, and I was able to bully convince them I would have a script ready by the festival, three weeks' hence. If I didn't and had to withdraw... well, I'd lose the $35. That deadline and mighty cash risk was enough to scramble my journalist brain into action. The first hurdle was finding a second actor. After spending a week in text-message talks about whether I could just do it myself, which would allow me to, you know, improvise a fair chunk of it (honestly, scripts are for wimps), I was unequivocally told that there HAD to be at least two people in the play (not just me in a series of wigs), and that festival judges could deduct points if you veered off script too much. So I HAD to write something. And I HAD to get a second actor. I solved the second problem first by sending up the Elizabeth Best signal. I've known Lizzie for years, and many readers may remember her star turns in my productions of The Tasmanian Babes Fiasco and How To Be A Man. She's talented, clever, has great comic timing and is incredibly stylish, a key component for character I needed her to play. Thankfully she turned out to be just crazy enough to sign on for the task of learning a script and blocking in less than two weeks. The first problem - writing a script - took a little longer to resolve. I'd had this idea for a two-handed comedy about an extreme diet that ends up producing a very weird side effect kicking around in the old noggin for a while. Finally I forced myself to start cranking it out. Unusually, I did this by moving my typing location to the couch, rather than the messy desk I usually set my laptop on. I cranked out the first act of the play in about three hours on a Wednesday night. I sent it off to Liz with a note saying "Just so you know it's not all in my mind". When I received a text from her the next morning saying she loved it, I was chuffed. I finished the second half off on the Saturday, then took it all around to Liz's place for a rehearsal. I was encouraged by her laughter as we read through the script. That's always a good sign, particularly when you've been writing and you're tired and you can quite work out if a joke is funny anymore. Or was funny in the first place. By day Liz works as an editor, and these skills came in very handy after that first read-through. She offered some great advice on how to ramp up the tension between our two characters, and I was able to rewrite sections to better effect. We compared diaries and worked out another two times we could meet up to rehearse. Monday, then Thursday, the night before our allocated performance time on Friday 20 July. In between then, we crammed lines. On Friday night, we turned up for our first-ever Drama Festival play. When I submitted the entry form, there was a section asking for the name of our performance group. I had no idea what to call us. I looked at the slightly embarrassing form, with my name listed under "Playwright", "Director" and "Performer". Gawd, I thought. I don't have a name for this group. It's just my stupid vanity project. As we went over our props and starting getting ready, we got a bit nervous. Would we remember our lines? Would the audience laugh? Would we get punished for not making the 30 minute minimum run time requirement? In the end, as I've said so many times before theatrical productions, you just have to go out and f*** that puppy (Don't hate me, animal lovers, it may be cruel but it's succinct). So we did. In a lovely gesture, a bunch of our friends had showed up to see us. I was incredibly grateful for that, because they were taking a chance on something that could very well be a steaming pile of unf***able puppy vomit. Thankfully, they seemed to enjoy it! Liz and I both remembered our lines, and the audience seemed amused by both our back-and-forth banter and our slapstick physical gags (which included me eating a bunch of weird things; and Liz spilling milk all over herself). We got some lovely feedback from audience members and the adjudicator, Xanthe, who suggested we submit the show to other festivals around the South-East corner. The festival continued, but I couldn't get to see much more of it, because of rehearsals and set construction work for Critical Hit, ImproMafia's newest season. Did I mention that I was rehearsing that while writing/rehearsing this little play? Well, I was. Yes, I'm that awesome/a complete idiot. We won Third Best Play! Out of 12 eligible plays in the Open Section, we came in third! Very surprising and quite delightful. I also won an Adjudicator's Award - for what, I'm not entirely sure! 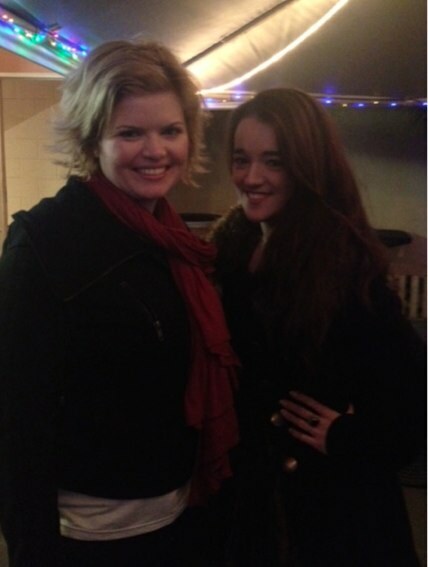 I must say a huge thank you to Elizabeth for coming onboard. She's now writing for a great new website called Super Quick Reviews, which I strongly recommend you check out. I'm so pleased she agreed to take a big leap into the unknown with me. 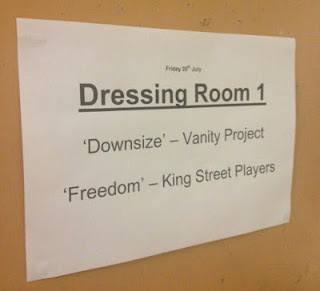 We're hoping to put "Downsize" on again at the Sunshine Coast Theatre Festival from 17-19 August. Until then, I'm back into the unscripted world with the SENSATIONAL new season from ImproMafia: "Critical Hit". It's totally inspired by geek culture - role-playing, D&D, high fantasy, Game of Thrones, World of Warcraft, you name it. We're doing SIX shows over two weeks - starting TONIGHT! You can check out more and buy tickets here. As always - thanks to everyone who comes along and supports what I do onstage. Your time is honestly the greatest gift and compliment a performer can ever hope for. Your laughter is a sweet, sweet bonus. Also for future reference "on how to ramp up the tension between our two characters" Zombies. I find introducing Zombies always helps. I'm sure that Critical Hit will feature zombies at some point. It somehow feels inevitable. For all the fun I had during the cast's research, it's looking like I'm. It going to be able to make it to that many shows. I should be there Friday night though. Huzzah! And move the name of the project - used it as a joke in Worst Possible Taste.